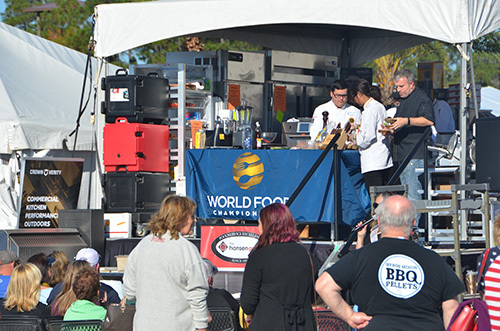 A week ago today I was in Orange Beach, Alabama for the World Food Championships. Looking back, I'm not sure why I thought this week was going to be a breeze. It was not. But the culinary experience was worth everything it took to make it happen. 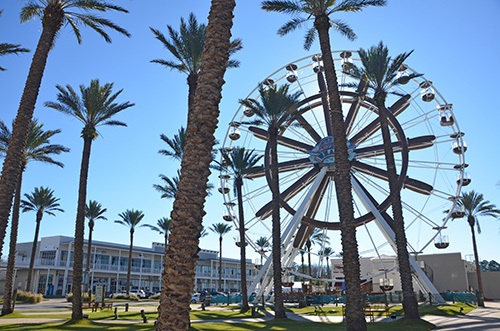 This one is about the World Food Championships and how someone goes from an itch to enter a contest to winning $110,000 and a World Championship. 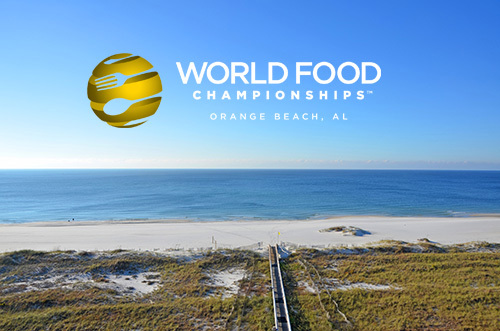 Last year, two of my friends, Josh Cooper and Craig Tabor, attended the World Food Championships with me in Orange Beach. While still on the contest site - they told each other that they would be competing there in 2017. True to their word, both of them qualified and I was damn proud of them and their teams. Here is what goes down during these championships. 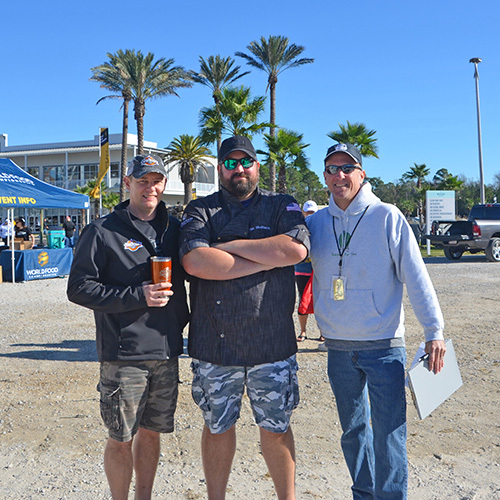 I ran into my friends, Chad Romzek of Kick Ash Baskets and Tim Shelburn, as they were waiting to get into the kitchen area. Tim was one of Craig Tabor's Sous Chefs for this event. Each opening round starts with a cooks meeting to cover rules, announcements, and to address any potential issues. For every contest except the BBQ ones, the process is the same. 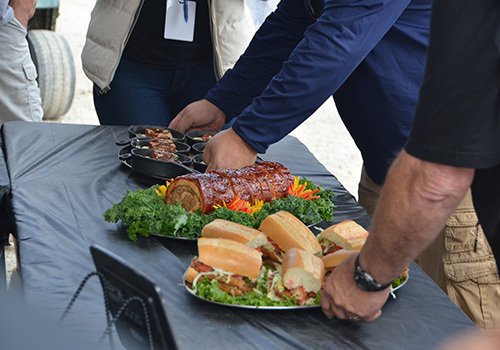 In the First Round, the qualified contestants have to cook two dishes in a two hour period - the Structured Build and Signature Build. This dish is designed to level the playing field and make sure the cook can really cook and that their recipe isn't a "one-dish wonder". 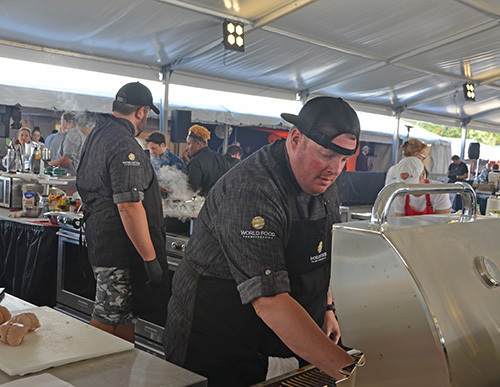 It is a required framework for the cooks within a category, for example, in the Steak category, their structured build was kebabs or for Chefs, they had to cook a paella. The Structured Build has to be turned in during a 10 minute window at the 1 hour mark. This is whatever the cook wants it to be as long as it is inside their assigned category. It can be the winning dish that got the cook through their Qualifier or it could be entirely different. This is turned in at the 2 hour mark. 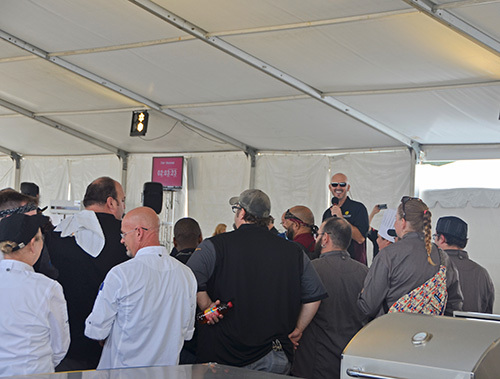 Up to 40 chefs and their sous chefs cook at once and as you can imagine, the kitchen arena is abuzz with activity from the opening seconds. Cooks bring every little trick and push every boundary, seeking out a competitive advantage because everyone is talented at this level. 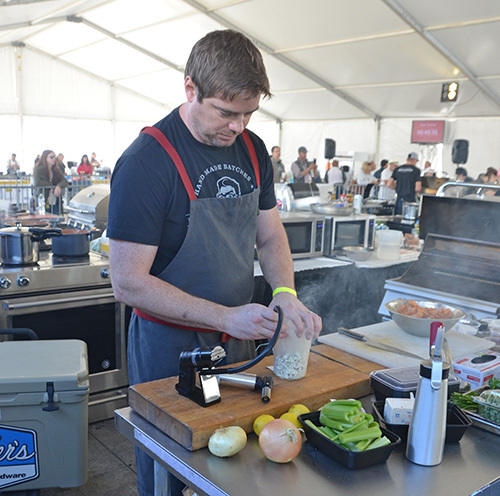 Here a chef uses a PolySci Smoke Gun to add a quick layer of flavor to ingredients. 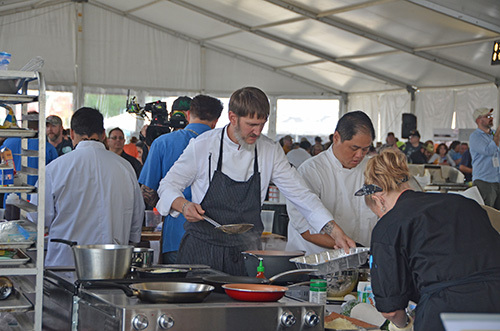 David and Gannon, sous chefs for Josh in the World Recipe Championship, prepping his chicken dish while Josh gets started in the back ground. 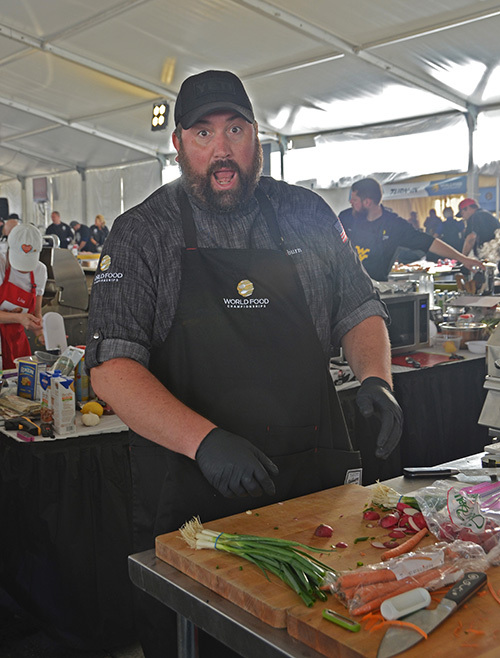 Josh had a busy 2017, appearing on Master Chef and winning 1st Place - Exotic Category at Memphis In May. We are good friends and I always enjoy when we get to cook together just for fun. 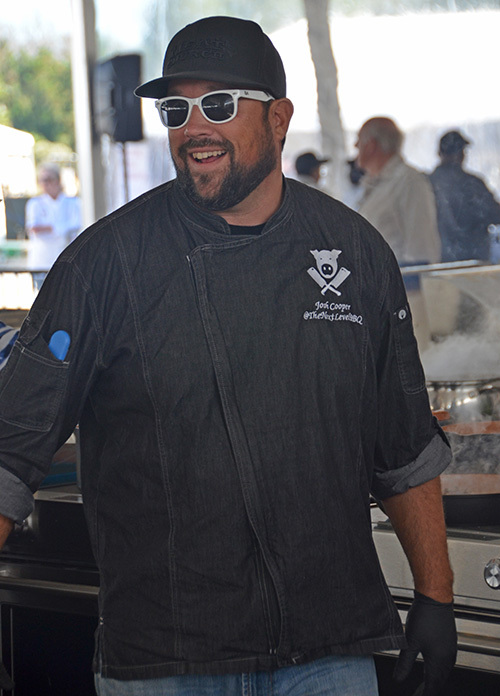 Another good friend of ours, Garry Yanke, was also a sous chef for "Big Green Craig". Tim Shelburn prepping and rocking with Team Big Green Craig. Love that I.O. Shen knife, I have the same one. 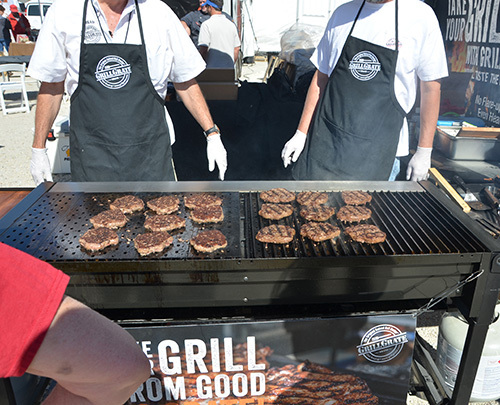 Craig getting his proteins going on the Bull Grill, the official grill of the event. Unfortunately, Josh and Craig's teams did not advance to the Top 10 round for the Recipe category but I'm still proud of these guys for making it this far. But, Craig scored high enough to get to compete in a Super Qualifier and placed 2nd so he already has his Golden Ticket for WFC 2018! 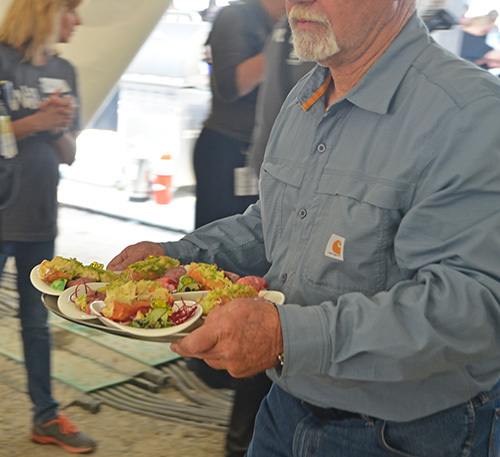 There were 28 free food demonstrations during the event to keep crowds informed and entertained. 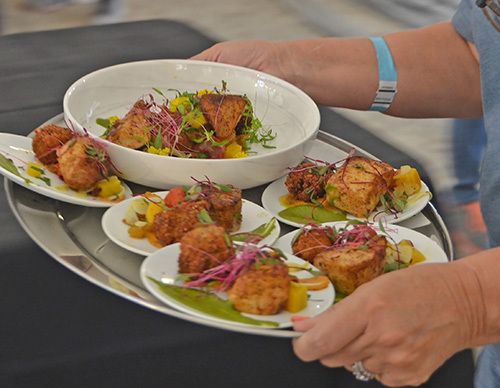 Fifteen local, regional, and national brands served samples in the WFC Tasting Village. 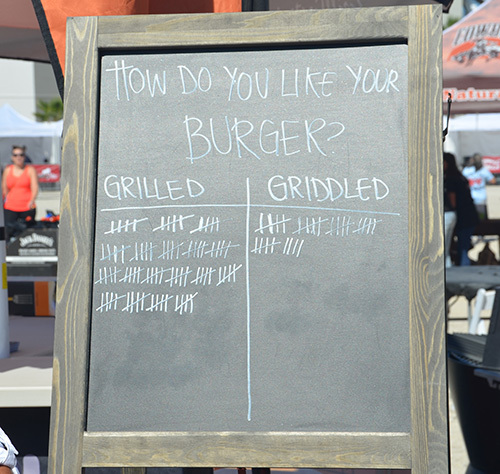 The GrillGrates team was cooking burgers griddled (left with the GrillGrates down) and grilled (right with the GrillGrates up) to see which the crowd liked better. I was shocked by this. 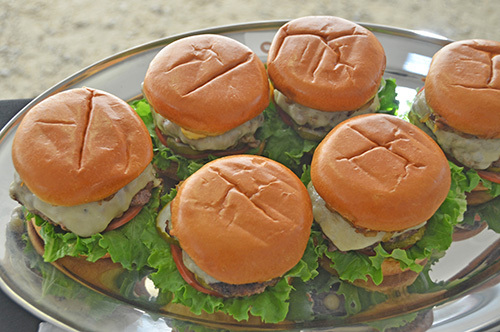 I think griddled burgers have better flavor because of the even crust. 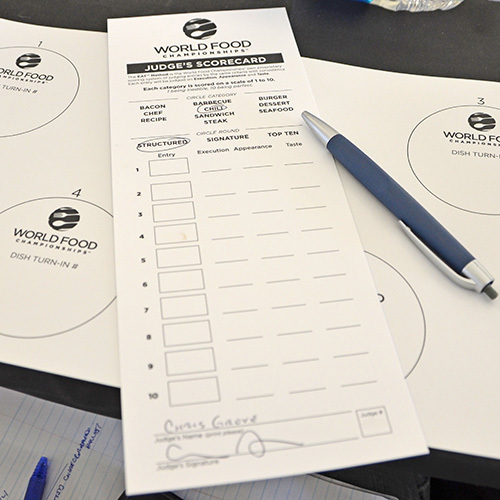 Judging is scored using 475 certified food judges - myself included. The scores from both the Structured and Signature rounds are combined and the Top 10 from each category go on to the next round. 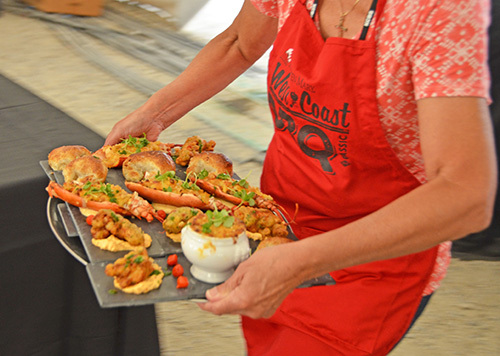 Table Captains bring the platters to be judged for appearance and then sampled. Patty melts submitted for the Burger Structured Build. 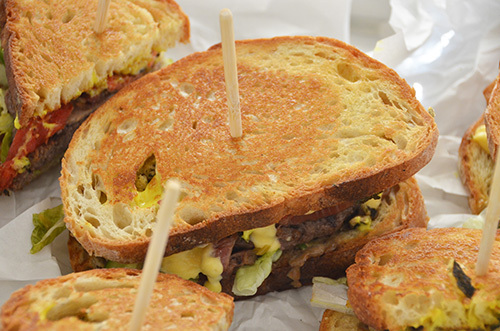 It might be a bit risky since some people debate if a patty melt is a burger (I say it is) but I like cook teams that take risks and generally reward them as such if all other things are equal. Some teams stay close to traditional and focus on execution. This burger looks like a basic burger but it was perfectly cooked and the portobello, shiitake, and Okiedokie sauce was to die for. At the other end of the spectrum, yet just as good, are things like these Loaded Brazilian Burgers. It was far from a basic burger with the poblano mango pickles, cotija, and Goucho Comeback Sauce. 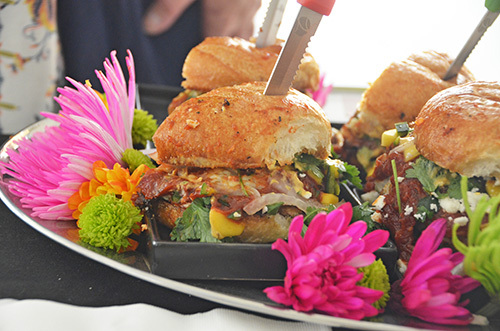 The chiles on this burger made it crazy good. 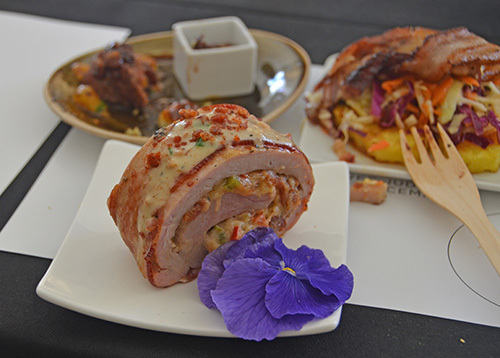 That's why I love judging food competitions - the different approaches to the same dish yielding great results. Sure, sometimes there is a "bust" but not many at this level. Perhaps the best thing I tasted in the Bacon category. The discussion after our scoring cards were turned in touched on how well this met the Bacon category since the bacon was primarily used as a garnish. That could hurt it in the Execution scoring. That may sound like nit picking but at this level when everything is so fantastic, a small difference like that can make or break your shot at Top 10. Another fantastic bacon entry. The detail on the bacon gravy on top was skillful and I could eat that stuffing mix all day long. 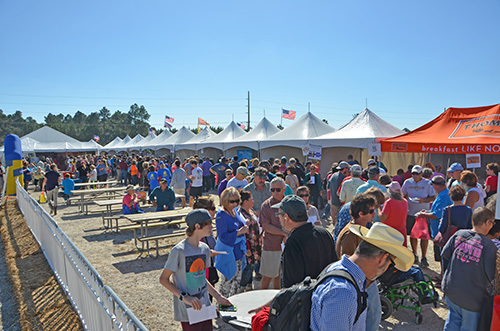 The first round of the BBQ competitions follow KCBS and IBCA rules. Here are some ancillary dishes being turned in. 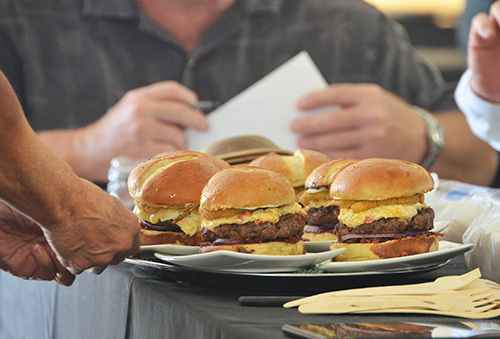 The top 5 from each BBQ competition go on to the Infused Round. The required Structured Build for Chili was "3-way". That's a Cincinnati thing, where at Skyline you get spaghetti noodles, a uniquely seasoned chile, and cheese. This entry stays closer to the traditional 3-way chili. 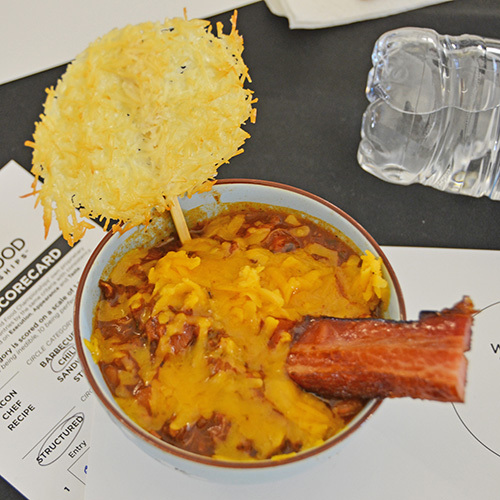 This entry had a cheese crisp and extra thick candied bacon added to the chili. The chili itself had tender shreds of beef. 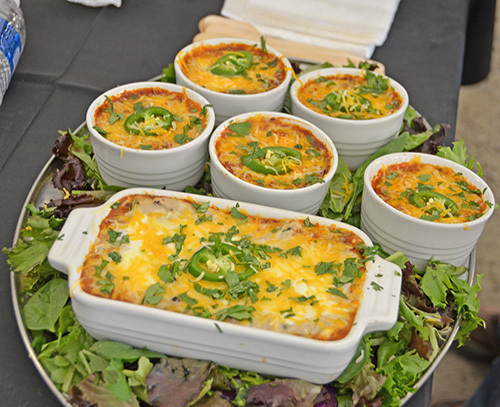 This team pushed the envelope of 3 way chili by creating a Tex Mex 3 way chili lasagna. 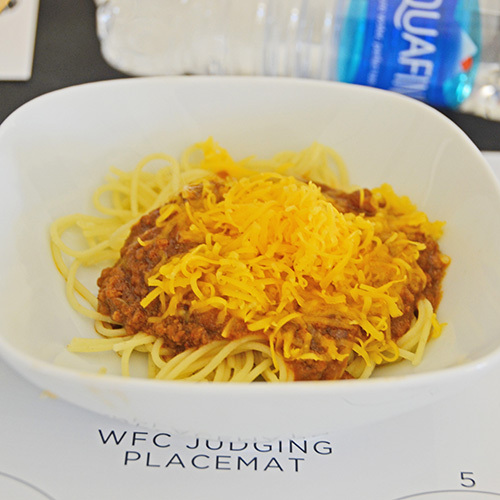 I loved the concept and the flavor, although the judges felt the chili itself was a little soupy. Five to ten more minutes in the oven and these would have been perfect. So after these first two rounds, the scores are tabulated and the Top 10 from each category go on to the Infused round. Here the recipe has to be something from the category AND use the featured ingredient. A lot is at stake in this round as the winner gets $10,000 and the World Champion title! 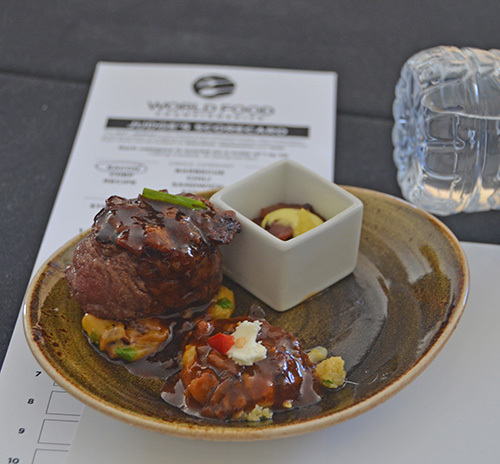 Because of my schedule, I didn't have to opportunity to be in the Judges Tent during the Infused Round to get plated shots of some of the final dishes. 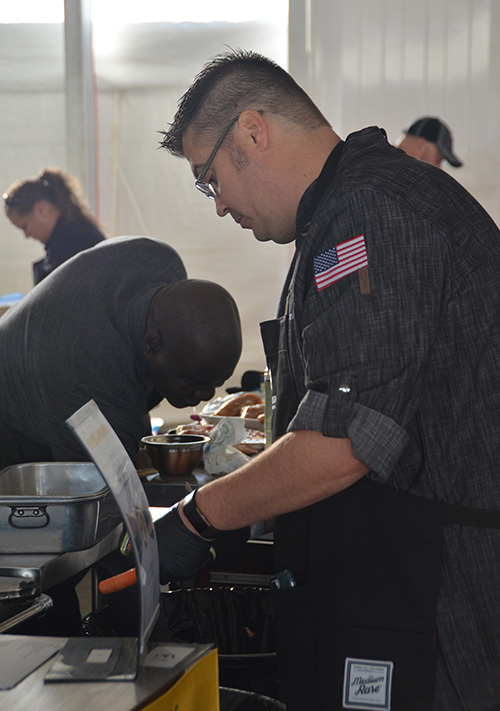 But I was able to snag a few pictures from the Chefs' Infused Round as they passed by our Chili judges' tables. The finals judges then select 1 winner from each category as the World Champion and winner of $10,000. Here are the results of the 2017 World Food Championships....so far. These World Champions from each of the 10 categories are going head to head at the Final Table in April 2018. Previously, this was held during the WFC week but this year it will be televised or live streamed with a major media partner. I am looking forward to this Ultimate Food Fight to see who wins the World Food Championships Grand Champion and collects the $100,000 grand prize. 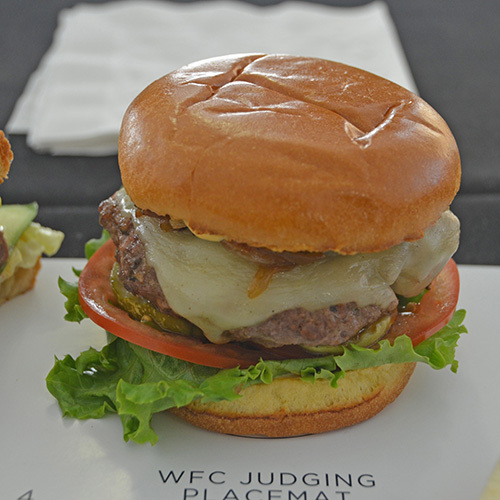 To keep up on next year's World Food Championships, keep an eye on their website for qualifier contests, competitor rankings, and how YOU can be a judge at WFC 2018!